The 70-647 Real Practice-Lab will provide you the necessary platform to gain hands on skills in Windows Server 2008 R2. By completing the lab tasks you will improve your practical skills in network & application services, identity & access management and business continuity & data availability. Becoming proficient in these tasks will also help you understand the objectives and competencies required by the Pro: Windows Server 2008, Enterprise Administrator certification exam. Network and application services: The exam objectives for the 70-647 are based on planning and designing solutions for enterprise server and domain administrators. Like any task of this nature you need to understand the benefits and drawbacks of each option before delivering the best solution for any given requirement. 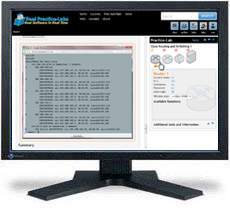 Using your Real Practice-Lab servers you have the ability to test all aspects of network/application services and because you can reset your servers quickly and easily you can change your configuration as many times as you like. This is ideal when testing the components for name resolution, IP addressing, network access, application delivery and terminal services. Core identity and access management components: The exam objectives for the 70-647 are based on planning and designing solutions for enterprise server and domain administrators. Like any task of this nature you need to understand the benefits and drawbacks of each option before delivering the best solution for any given requirement. Using your Real Practice-Lab servers you have the ability to test all aspects of Core identity and access management components and because you can reset your servers quickly and easily you can change your configuration as many times as you like. This is ideal when testing the components for Active Directory forests/domains, AD administrative model, public key infrastructure and enterprise-level group policy. Business continuity and data availability: The exam objectives for the 70-647 are based on planning and designing solutions for enterprise server and domain administrators. Like any task of this nature you need to understand the benefits and drawbacks of each option before delivering the best solution for any given requirement. Using your Real Practice-Lab servers you have the ability to test all aspects of HA / data availability components and because you can reset your servers quickly and easily you can change your configuration as many times as you like. This is ideal when testing the components for software updates and compliance management, operating system virtualization and data management/access.